Milton Keynes, United Kingdom - 8th January 2013—Synology ® Inc. today launched VisualStation VS240HD, a cost-effective surveillance solution designed for ease of multi-channel viewing on local HDMI displays. VS240HD boasts powerful image decoding capability by supporting up to 24 channels of simultaneous high-definition viewing at 240 FPS in 720p. Dual HDMI video outputs make it an ideal surveillance solution for large-scale deployments, allowing users to stream high-quality footage to different screens in a state-of-the-art security control center. “VS240HD is an economical and compact device dedicated to live-view monitoring. It does not require a PC and saves on energy bills by consuming merely 14.4 watts in full operation while still maintaining a space-saving design,” said Chad Jiang, product manager of Synology Inc.
Paired with Synology DiskStation or RackStation, VS240HD supports video streams in MJPEG, MPEG4, and H.264 compression formats, including audio. Pan/tilt/zoom (PTZ) cameras are also supported to offer extensive monitoring and object tracking. Users can view video footage, both live and recorded, and export high-quality HDTV clips and snapshots to external USB storage devices. All these powerful features can be managed easily through an intuitive user interface with a USB mouse. Synology VS240HD is now shipping globally. Founded in 2000, Synology is a young and energetic company dedicated to developing high-performance, reliable, versatile, and environmentally-friendly Network Attached Storage (NAS) server products. Our goal is to deliver user-friendly solutions and solid customer service to satisfy the needs of businesses, home offices, individual users and families. 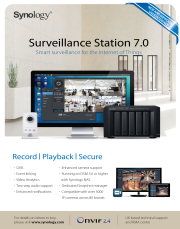 Here is a selection of case studies from businesses using Synology Surveillance Station.